WIKA has expanded the application range of its hygienic diaphragm pressure gauges with the model PG43SA-S, which is now also available in a version with ATEX approval. 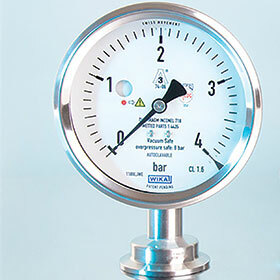 The pressure gauge can thus be used in hazardous areas for ignition protection type Ex h zone 1 (gas) and zone 21 (dust). For safety-critical processes in the pharmaceutical and food industries, the model PG43SA-S and the other instruments in the series are also suitable as a result of their ‘dry measuring cell’ (no risk of contamination by the transmission fluid), the robust diaphragm element and the high overload protection. In addition, the model PG43SA-D features integrated diaphragm element monitoring whereby a diaphragm rupture is flagged by an indicator on the dial. In the event of such a failure, a second barrier keeps the process sealed. All hygienic pressure gauges of the series fulfil the 3-A Sanitary Standard and are certified in accordance with EHEDG. They are CIP and SIP capable, and optionally are also completely autoclavable.